Caring for children with disabilities affects families all over the world. No matter where they live, ages, social status, the color of their skin, whether they are wealthy or poor…there is no discrimination when it comes to children with disabilities. And caring for children with disabilities is a hardship that these families endure daily but the joy of having their child with them far outweighs those hardships and turns into stories of triumph! 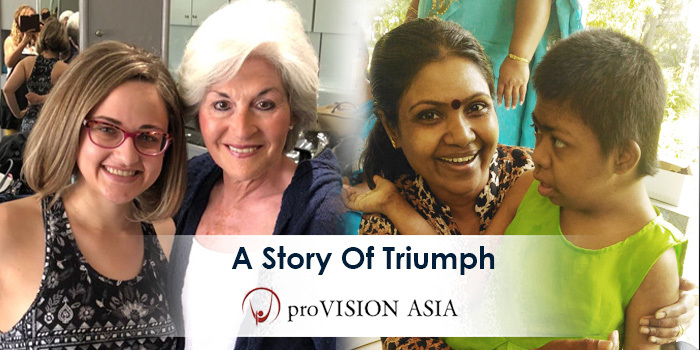 Dr. Chip and Jean Kingery (Founders of ProvisionAsia) have both learned a lot from their experiences and have dedicated their lives to serving children with disabilities in Bangalore India. Almost 17 years ago we had an unsettling phone call with a probable diagnosis that our youngest daughter, Naomi, had juvenile diabetes. This is also called type one diabetes where the child is totally dependent on outside insulin to live. On September 2, 2001, we found ourselves in a totally new situation. Our future would be involved in caring for a child with a disability. We did not feel equipped to do this! We have three children in our family unit. Certainly… It’s natural that our attention would be one hundred percent on the child with this new diagnosis. Certainly …it’s not uncommon that we miss emotional and physical time with our other children. This is something to think about when we consider our Family Picture. I only wish I gave more intentionally at the beginning of the diagnoses to our other daughter and son. Because juvenile diabetes, type one, is considered an invisible illness or invisible disability because even though it cannot be seen outwardly but it affects daily life, it can be debilitating and it is lifelong. Here is a glimpse into the necessary hands-on care needed every day: numerous blood checks; giving or helping with constant injections; dealing with emotional highs and lows depending on her blood sugar levels; constant doctor appointments; knowledge of carbohydrate intake; managing food preparations; and supporting community awareness and involvement in fundraisers to help researchers find a cure. Perhaps the first thoughts travel to unknown places of the child’s future with probable health complications. The following thoughts flow rapidly from too much care or too little. Caring for a child with disabilities is a dance of sorts. Am I doing enough for my child or perhaps doing too much for her? Am I helping her to become more independent as she grows older or dependent on others as she matures? Looking back I wish I would have had a mentor to help me through the emotional and physical process of caring for a child with a disability. No doubt that I could have been a better caretaker for my daughter. Today my daughter has been married three years and the dance continues. I am in the background now. Some days my role is to pray from a distance and encourage her when she reaches out to me. Her future will have health challenges due to the harshness of diabetes but it is a story of triumph for my daughter, Naomi. Our family unit has strengthened over these last 17 years in many ways. Everyone’s life has changed. Caring for a child with a disability – whether it’s visible or invisible – is a privilege/responsibility allowed by God. Embrace this challenge and know that you are not alone. Find comfort and peace in the community of people who understand what you face daily. Anu and her husband brought in their sweet daughter Monica. First off, it is endearing to us when both parents bring their child in seeking help. The majority of families that we serve do not have a mother and father that bring them in. Both of Monica’s parents genuinely want the best for their daughter and you could tell as we asked them questions and they filled out the registration forms. They also have extended family who helps Monica every day. It has been a long battle caring for this child with disabilities, who is now a beautiful 18-year-old. And for now, they have come to us for help, to lighten their load. Throughout their visit, Monica was smiling while her parents were trying to absorb as much information and resources as possible. We were able to help them with government advocacy and physiotherapy. They will also be joining our family retreat coming up which will give them a chance to be with several families also caring for children with disabilities. We want this story to continue to be a triumphant one, not one of sorrow and despair! Our sincere hope is that we continue to change the lives of these families and individuals who are caring for children or other people with disabilities. We aim to give them hope, encourage them and show love in all we do!